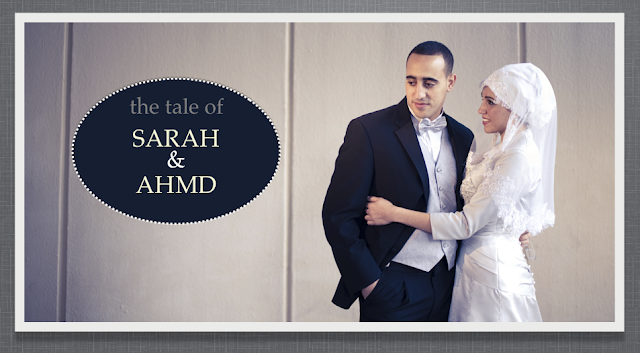 For Egyptian American couple Sarah and Ahmed, staying true to their culture and faith was important. Set in the heart of downtown, Raleigh in North Carolina, Sarah and Ahmd held a classic blue, silver and white ceremony for their guests. *C'était important pour le couple égyptien américain Sarah et Ahmed, de restés fidèle a leur culture et leur foi. Situé au cœur du centre-ville, à Raleigh en Caroline du Nord, Sarah et Ahmed ont tenu un classique bleu, argent et blanc pour la cérémonie de leurs invités. In accordance with the couple’s heritage, elements of Islamic and Egyptian customs were incorporated in the ceremony. Include a “Zaffa”, in which drummers, sword carriers and other musicians fill the space with music to announce the commencement of the marriage ceremony. 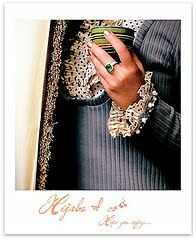 *Des éléments de coutumes islamiques et égyptiennes ont été incorporées à la cérémonie.Inclure la "Zaffa", dans laquelle les batteurs, les transporteurs épée et d'autres musiciens remplissent l'espace avec de la musique qui annonce le début de la cérémonie du mariage. 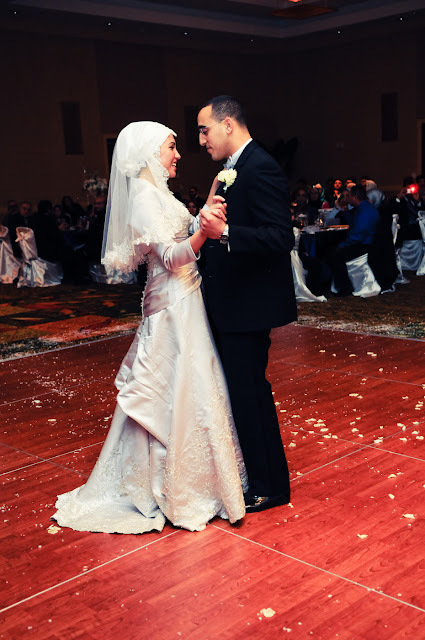 To add a modern spin to the traditional “zaffa” procession, Sarah and Ahmd combined Arabic music and Indian drumming (using a “tabla”) with the western beat of “here-comes-the-bride,” a classic piece of music. *Pour ajouter une touche moderne de la traditionnelle "zaffa" , Sarah et Ahmed combinés de la musique arabe et indienne (en utilisant une "tabla") avec le rythme de l'Ouest d '«ici-vient de la mariée», un morceau classique de la musique. 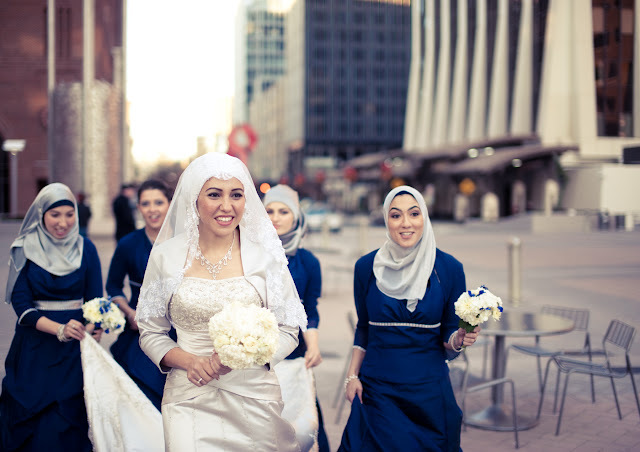 I love the photos of the bride with her bridesmaids walking so casually around town. That's different. I wish the couple a happy and blessed marriage inshaAllah. May Allah (swt) bless the happy couple! 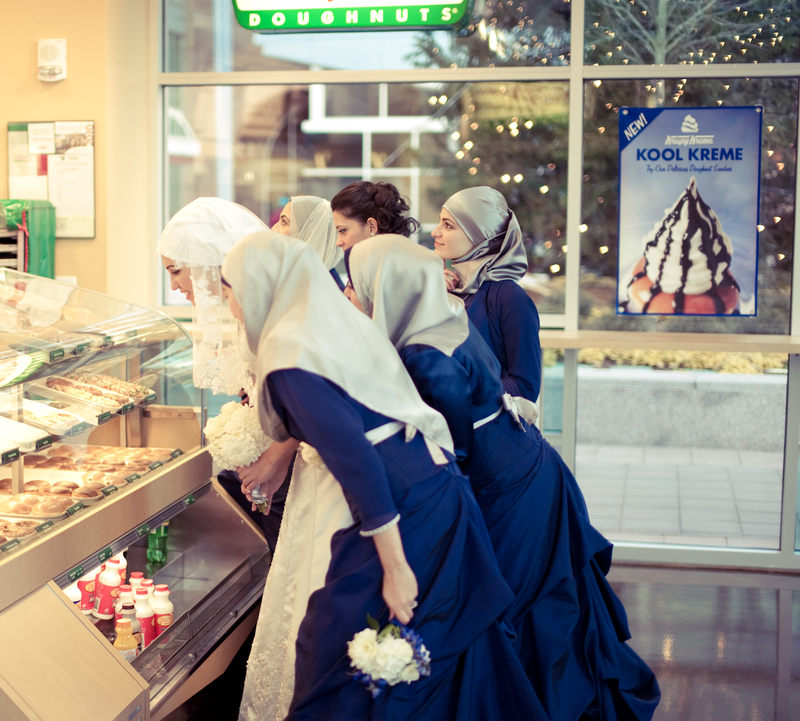 Where did she get the bridesmaid dresses? I love it! 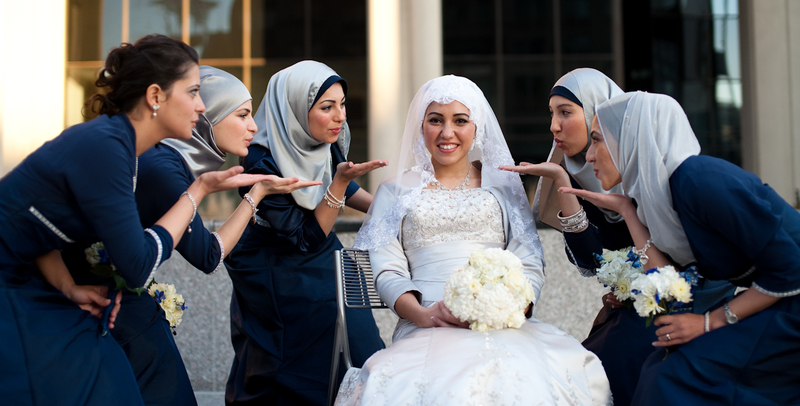 It’s so difficult for a hijabi to find a dress – with everything being off-should or old-ladyish.